Title: Where There Be Gods! Synopsis: Continued directly from Fantastic Four #215, this issue opens with the evolved superbeing the Futurist, formerly known as Professor Randolph James, creating panic as he airwalks through Times Square on his way to the Baxter Building. The Futurist is observed by Blastaar who recognizes that he is immensely powerful, but naïve and unskilled in the use of his powers. As the Fantastic Four approach to speak with the Futurist, Blastaar takes advantage of the opportunity to ally himself with the being and create the illusion that the heroes were preparing to attack. 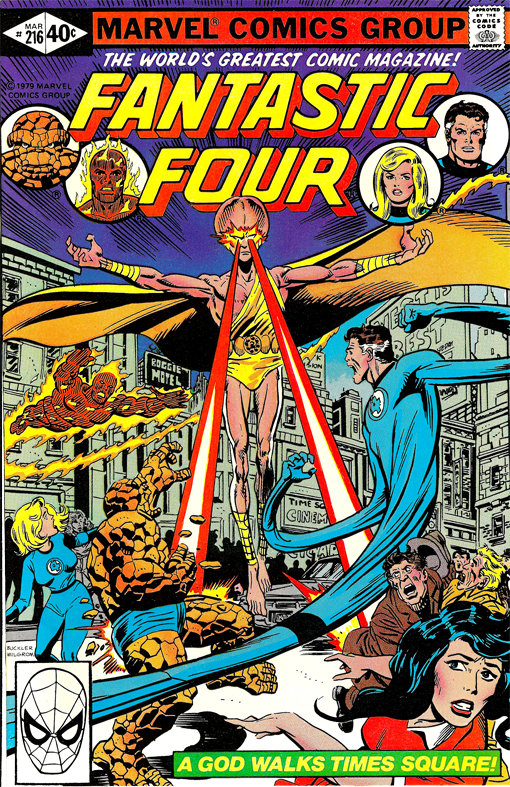 The Fantastic Four succeed in defeating Blastaar, but the Futurist intervenes, telling the team that his ally was correct and that the heroes “seek to destroy those who manifest more power than yourselves.” Blastaar and the Futurist go to the Baxter Building where they render the Invisible Girl unconscious in front of her son Franklin and the Living Bomburst slips away, intent on returning to the Negative Zone through the Baxter Building portal. In a moment of anger and fear for his mother, Franklin manifests his latent power and hurls Blastaar through the portal into the Negative Zone. The Futurist realizes that he had been duped by Blastaar and makes an uneasy peace with the Fantastic Four before disappearing into the stars to pursue his new destiny as a child of the cosmos.